Although most efforts focus on increasing the number of donors is the objective - the role of the intensive care clinician in organ donation does not end in donor identification and referral or even collaboration in the family approach. Rather, it must also include a commitment to provide the highest number of donor organs in the best possible condition through optimisation of donor physiology. To do otherwise might be regarded as a betrayal of the trust that a donor and their family place in the healthcare professionals who propose donation as a component of end of life care. 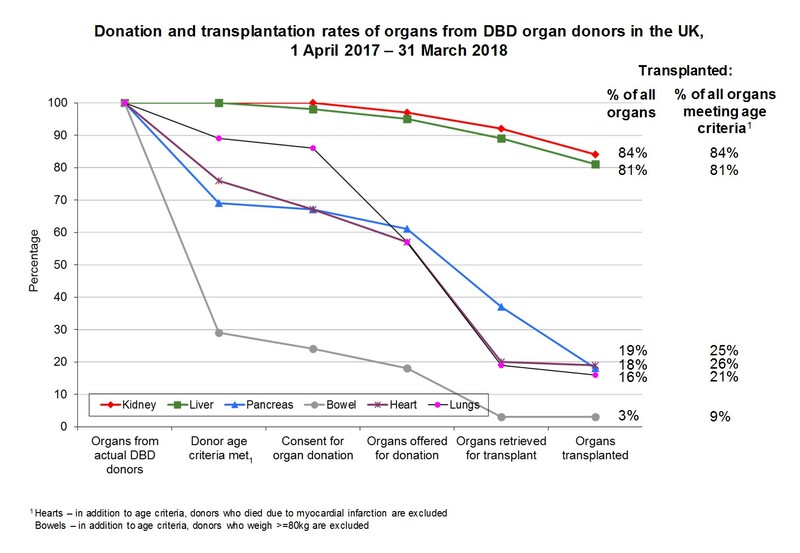 Rates of retrieval and utilisation of organs from DBD donors in the UK are shown in the figure below. In the UK, an actual DBD donor donates an average of 3.7 organs, with the number of organ transplants being retrieved and transplanted – particularly the thoracic organs - falling sharply in donors over the age of 50 years. There is now considerable evidence that the application of standardised donor management protocols increases the number of retrieved organs, with a particular impact on retrieval of cardihoracic organs. the pathophysiological consequences of brain-stem death. The pathophysiological features of brain-stem death, along with their incidence, are listed in the table below. Their severity or likelihood is proportional to the rate of rise in the intracranial pressure, and is typically worst in children and young adult. Whilst potentially severe they are almost always correctable, although if untreated may result in rapid deterioration and cardiac arrest. a transient phase of severe hypertension and tachycardia that is related to a massive out-pouring of catecholamines (sometimes referred to as the sympathetic storm), and which at its worst represents a variant of Takotsubo’s cardiomyopathy that is associated with ECG changes, myocardial irritability, rises in cardiac troponins and echocardiographic evidence of regional or global myocardial impairment. The catecholamine surge of the sympathetic storm triggers a very sudden rise in left ventricular end diastolic and pulmonary capillary pressures, which in turn results in disruption of the integrity of alveolar-capillary barrier. 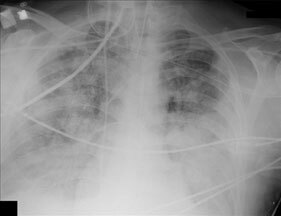 Although pulmonary capillary pressures may subside as the left ventricle recovers, alveolar flooding may persist for some time. The loss of significant volumes of protein-rich fluid into the alveolar air spaces can cause both profound hypoxaemia and also hypovolaemic shock. In addition, the injury to the pulmonary microcirculation can establish an inflammatory process that may serve to both amplify and prolong this phase of ‘high-permeability’ pulmonary oedema. Brain-stem death implies loss of hypothalamic function, and in practice patients who are brain-stem dead frequently exhibit one or both of the consequences of hypothalamic failure – hypothermia and failure of the neuroendocrine hypothalamo-pituitary axis. Hypothermia is almost invariable, and is primarily the result of vasodilatation and the consequent loss of heat to cooler surroundings, exacerbated by a reduction in metabolic rate and heat production due to loss of muscle tone. It is often overlooked during initial clinical assessment because the patient’s peripheries feel warm (this being the primary cause of the hypothermia), and may take some hours to correct, particularly whilst the patient remains vasodilated. Hypothermia delays the diagnosis of brain-stem death and may exacerbate haemodynamic and haemostatic instability. Diabetes insipidus is the most immediate endocrine consequence of hypothalamic failure, and is caused by loss of anit-diureteic hormone (ADH) secretion from the posterior lobe of the pituitary gland. Lack of ADH results in the excretion of large volumes of dilute urine, sometimes in excess of 1000mL per hour, and if untreated leads to hypovolaemia, hypokalaemia and hypernatraemia. 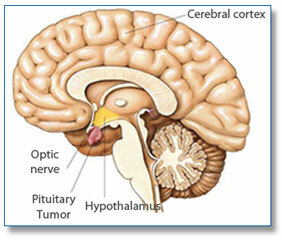 Although hypothalamic failure also deprives the anterior lobe of the pituitary gland (adenohypophysis) of higher centre control, the clinical significance of this is unclear, particularly since the blood supply to the gland itself is largely extra-dural (implying that the intrinsic functions of the gland might be preserved in the brain-stem dead donor). Donor optimisation is an active process that may require escalation of monitoring and therapies if the full donation potential of the patient as a donor is to be realised. In principle it requires a switch in focus from therapies that are directed towards resuscitation of the injured brain (which is dead) to those that focus upon restoration of physiological and metabolic homeostasis of the transplantable somatic organs and tissues. It is particularly important to make every effort to improve cardiac and pulmonary function. The immediate objectives of donor optimisation should be achieved as soon as possible after consent / authorisation for organ retrieval has been established, and should not be delayed until the arrival of the Specialist Nurse – Organ Donation. Whilst the timely application of donor optimisation interventions should be seen as a standard of care that all potential donors should receive, it is of particular importance in circumstances where retrieval of the cardiothoracic organs is a possibility, and there is persuasive evidence that the number of retrieved hearts and lungs can be significantly increased by the early application of invasive haemodynamic monitoring and lung-protective ventilatory strategies. Many critical care staff have little experience with the physiological optimsation of a potential DBD donor. A donor optimidsation care bundle has been developed by Dr Gerlinde Mandersloot (Royal London Hospital, Whitechapel) and endorsed by the National Organ Donation Committee. Local Donation Committees are asked to ensure that the care bundle is adopted by their critical care services. The Donor Optimisation Extended Care Bundle document can be found at the bottom of the page. Donor hospital staff face many practical obstacles to initiating and sustaining donor optimisation therapies, and this adversely impacts upon the number of hearts and lungs retrieved from DBD donors. Some of these obstacles may be overcome through more effective collaboration between local hospital staff and the cardiothoracic retrieval teams. From 1st April 2013 NHS Blood and Transplant (NHSBT) is supporting a so-called scout' pilot scheme in which a trained member of the cardiothoracic retrieval team, (sometimes referred to as a scout ) will attend a donor hospital in advance of the rest of the team to assist with donor optimisation according to the Extended Care Bundle. This proposal has been supported by the National Organ Donation Committee, the Cardiothoracic Advisory Group and the Directorate of Organ Donation and Transplantation at NHSBT. It is planned to run for a year in the first instance, and include those hospitals within a two hour travel zone of the cardiothoracic retrieval centres. If successful, the scout pilot will be extended to all hospitals.